Personalized jewelry box, shipped fast - Makes a great gift! Personalized wooden jewelry box, shipped in a fitted gift box, ready for gift giving. 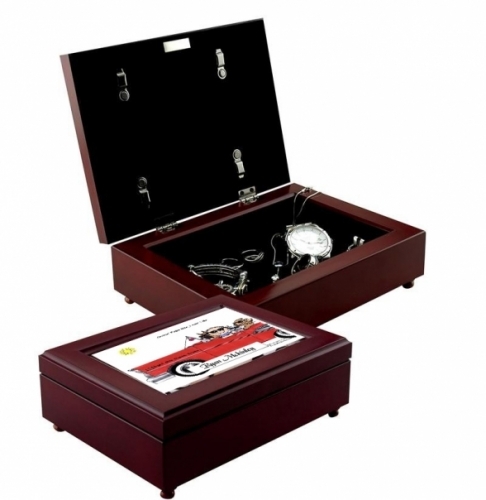 Our wooden (Mahogany) jewelry-keepsake box is lined with black velveteen and adorned with four silver legs. Your personalized cartoon scene is centered on the top, measuring approximately 4" x 6" and is protected behind glass. Hinges are flush mounted, and the top offers the added protection of magnetic closure. Overall, this treasure box measures approximately 6" x 10" x 2-1/2". Inside storage measures 4-1/4" x 6-1/4" x 1-5/8". Photos are for representative purposes only.